I'm pretty excited that I've completed a total stereo swap to Wetsounds gear including RGB LEDs, but I'm getting a horrible high pitched modulating noise when the LEDs and RGB controller are turned on. This is present even when there is no music (bluetooth aux in, on pause) and the engine off. if I turn off the LEDs with the remote controller, the noise completely goes away. When the LEDs are on and rotating colors, the hoise changes frequencies depending on the color. There's no way that this should be expected, so something is wrong here. The speaker rings and the LED strips are wired in parallel to each other and then daisy chained around the boat to the controller. The controller ground and LED grounds are to the battery (same with amps, ws-420, stereo). Power for the controller module is from the ws-420 +V. Anybody experience something similar and how did you address it? Sub'ed because I am getting the same thing with my wet sounds led controller and lights and cant seem to get rid of it. Mine isnt that loud but it is noticeable and audible with no music playing. I would love to see pics of your setup! I am looking to change my in-boat speakers over from the stock Rockfords to an after-market brand and also putting in the ws-420 so I can control tower speakers and boat speakers independently. edit: After re-reading your post have you tried to swap the power in for the controller from your ws-420 directly to the battery....I dont have the 420 but that may have something to do with it? I do not have first hand experience with this problem but I can make some suggestions based on my understanding of noise issues in general. Pure speculation but worth your time and effort. Do not source power and ground from any harness shared by the audio components. Run a 14-gauge B+ and ground directly to a junction block as close as possible to the battery. Fuse this link at the power source. Use an interrupt relay if you need to control the power remotely via a switch. Use a traditional noise filter like a PAC CSS-10 which contains a series choke coil and a parallel capacitor. You are not filtering boat noise from coming into the controller in the conventional sense. You are actually filtering noise that would be generated by the controller and is modulating the boat's voltage supply. You may also want to add a choke coil to the ground wire. You may upgrade the capacitor in the filter or supplement it with to a 3300 mfd polarized cap from + to -. You may even try a larger cap. Much larger and the cap should be fused. Keep all filters and caps a safe distance from a wet battery. You could even try a 10-amp diode on the line coming into the controller. First + and then -. These are one-way devices and could help squelch noise that is back-feeding into the electrical system. Physically position the controller away from any audio components, particularly source units. If you have an ACR and all audio components are wired direct to one battery then try connecting the lighting to the other battery. If this works but you do not want to use the starting battery then add a small battery (like a sub compact battery) for the lighting via a diode isolator (looks like a heat sink). This device allows the lighting battery to get a charge while separated from the other electrical circuits. Step by step, do what is most cost-effective first. Hopefully someone will chime in who has had direct experience with this issue and has resolved it with fewer steps and less expense. Contact Wet Sounds for a CAP. I got a quote from Earmark to install some Icon 8's with the LED rings and RBG controller. I can't remember where but somewhere I read there can be an issue with noise with these so I asked Earmark. He said yes there can be noise and wasn't sure why but said noise usually comes from a grounding issue. I am concerned about spending the money on this and not being able to get rid of it so please keep us posted on what you find out. If it can't be fixed I would go with 1 color LEDS. Another concern I have about them is what is allowed to be on at night? Wil I get a ticket if I have colored LEDS on at night? Easy way to troubleshoot without having a bunch of time/money invested. You definitely see the same controllers on ebay like nitrous said, that mark up is HUGE! Wetsounds posted a video in their instagram claiming the controller being used was theirs. Funny thing was I had seen the video on youtube, and the owner said it was an Oznium controller. I had bought my controller based on that video, well before Wetsounds ever posted it to their link. 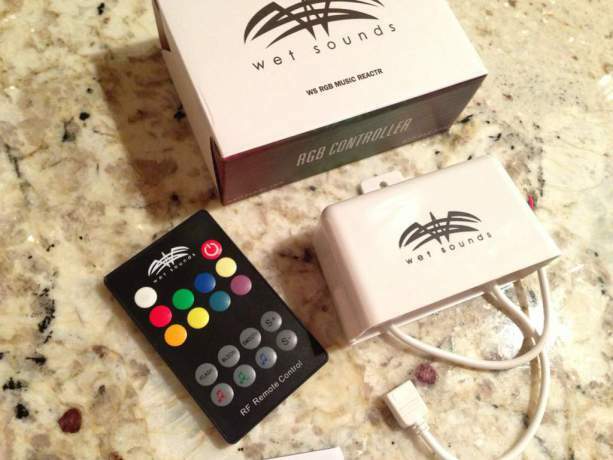 I spoke with Joe at Earmark on the subject of noise elimination for RGB controllers. He is way out in front of this and has had success getting rid of most of the noise. It began with his own showroom display. One of the advantages of purchasing a Wetsounds controller or purchasing from a supporting ME dealer is the technical assistance you get if you have noise or any other problem. You won't get that support off ebay. Thanks David for indicating there is a solution for the issue, but making sure to plug buying the overpriced version from a dealer in order to get issue resolved. Or you could just let us know what the fix is without trying to plug the dealer. But that's always your goal. A lot of crew members purchase high priced stereo systems and enjoy doing the installs themselves. We often come here for solutions to any roadblocks we encounter. I am very appreciative of the forum. But to get a response to an issue that basically says, "Yep, there's a fix for that, but I'm not telling you. That's the advantage of going through a dealer". You should let us know the fix or not comment at all. A bunch of crew members would greatly benefit from it as it seems it's common. I tested my setup for the first time over the weekend. With the engine and stereo off, (Rev10) I could hear a hum from the lights. I purchased the WS badge one and left the supplied capacitor on the power plug. What size is the capacitor?? Just curious..
Really? That's just being lazy. In post #3, I did a pretty thorough job of outlining all the steps I know of in eliminating the noise INCLUDING giving a specific value for a capacitor. You are welcome for the help. If you like to do it yourself then I suggest you get busy, roll up your sleeves and follow my suggestions rather than taking shots at people. Btw, with noise such as this there is not going to be one fix that compensates for every variable. Beyond that I was writing specifically to MEYJR that his proposed dealer was on top of the issue. Joe whipped the noise but had nothing to add beyond my list of suggestions. I had the same issue with the OEM version of this RGB controller, where I could hear the high pitch noise come on and off with the ligts. Thanks for the suggestions above, i was able to remove it with the PAC CSS-10, although if I try to use the audio input, I get it back. I'm thinking to try to ground my audio head-unit to the same location as my amps just in case. Update: Got rid of most of the noise from the LEDs but still have a little bit of engine noise. I think this last bit of engine noise is due to my blue tooth and ws-420 not being ground directly to the battery. Other than this minor bit of noise, this system is unreal. Advice regarding tower configuration: Single Sinister-2 and 4 Rev10s is incredible. You can tune the amp down to avoid distortion and then run at full volume for the clearest sound ever! Sorry if i missed it somewhere in the thread but I'm having the same problem as you seemed to have fixed.